Today I am sharing a LDRS Creative project. This is the new stamp set called "A New Beginning" and these are such fun to color. The Stamp set here "A New Beginning" is part of the most recent release along with this beautiful paper stack called "You are my Sunshine" isn't that the perfect name for this bright and cheerful 6x6" paper stack? I have also used a couple different LDRS Creative dies. I had a lot of fun with the Super Sprigs set as you can see below. Last but not least, I also colored another stamp from this same stamp set and added it to the inside of the card. 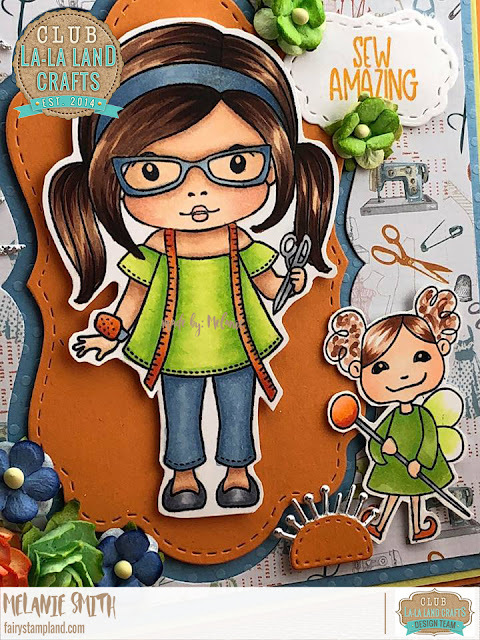 I hope you have enjoyed my projects today, and that it has inspired you to get crafty! 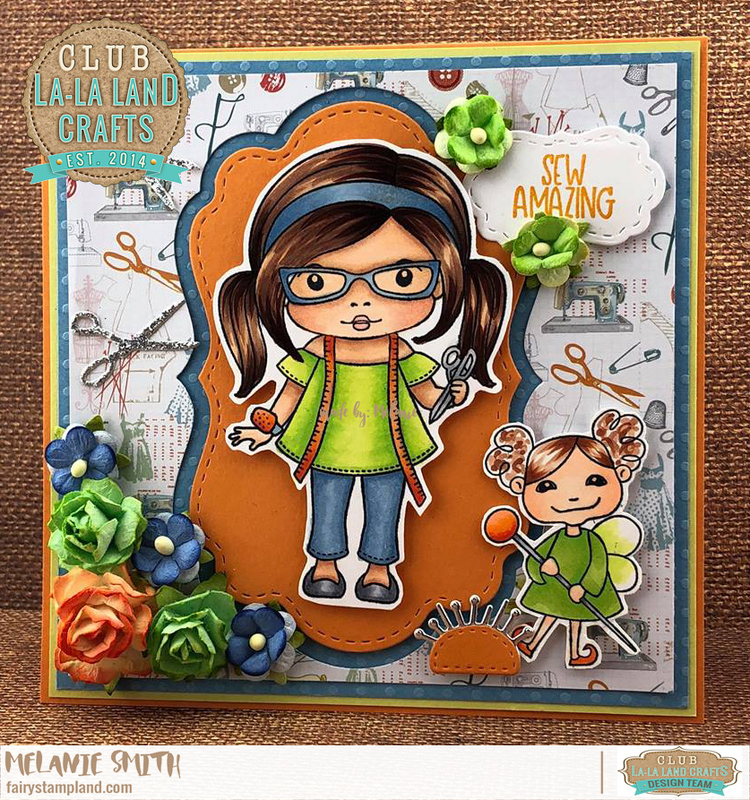 I have an exciting new La-La Land Crafts Club kit to share with you today. This is July's club kit and is ONLY available for 2 more days. If you would like to receive these in your mailbox details for signing up will be at the end of this post. 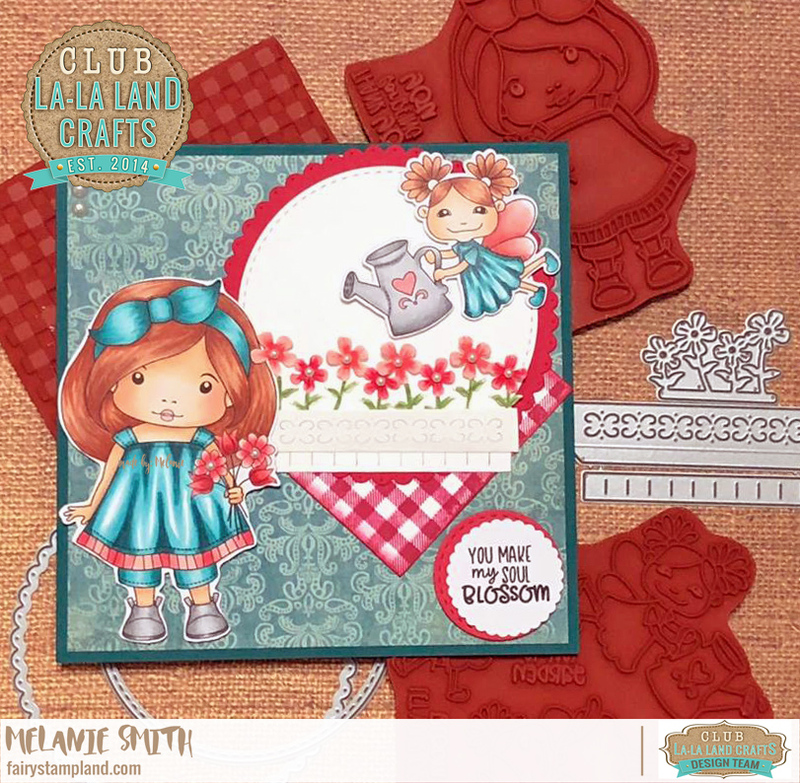 For this first card I have created an adorable flower box card featuring the EXCLUSIVE flower box die set. These two dies create a pocket style windowsill. You simply score along the flower box score lines and glue those flaps to your card, on top of the base, and it creates a pocket. I have chosen to add the flowers from this set into the pocket. Isn't it adorable??? For this card I added the Pierced Scalloped Circles Dies, Stitched Nested Circle Dies, Stitched Tag Dies and the Just For You background stamp set. I think I like this second card even more than the first one. If you are a Club Subscriber you will receive the design team's FREE tutorials. Each of us create a club ONLY tutorial each month and this double pocket card is my tutorial for this month. It was super fun to make and I am just loving the flowers used as a border inside the lower pocket. Then little flower fairy all tucked into the top pocket which will be a fun little surprise for the recipient. Our monthly club has 3 options. You can choose the stamp only package, the die only package or the full bundle. This months full kit has a value of $69.99 so being a subscriber has lots of savings along with the following PERKS! Also each month you will receive a "Surprise" in the mail all dressed up in a shiny gold envelope. Each full kit includes 2 Stamp Sets and multiple dies. Everything is coordinated by a different theme each month. Exclusivity ~ These are only released to club members and will not be introduced to the regular customer line for at least 6-12 months. FREE Tutorials ~ You will receive a link to the private tutorials created JUST for club members. Each Design team member makes one, so that is 10 FREE tutorials. LDRS Creative ~ Creating a Scene with "Shore Lucky" Stamp Set. Today I have a fun clean and simple card to share with you. 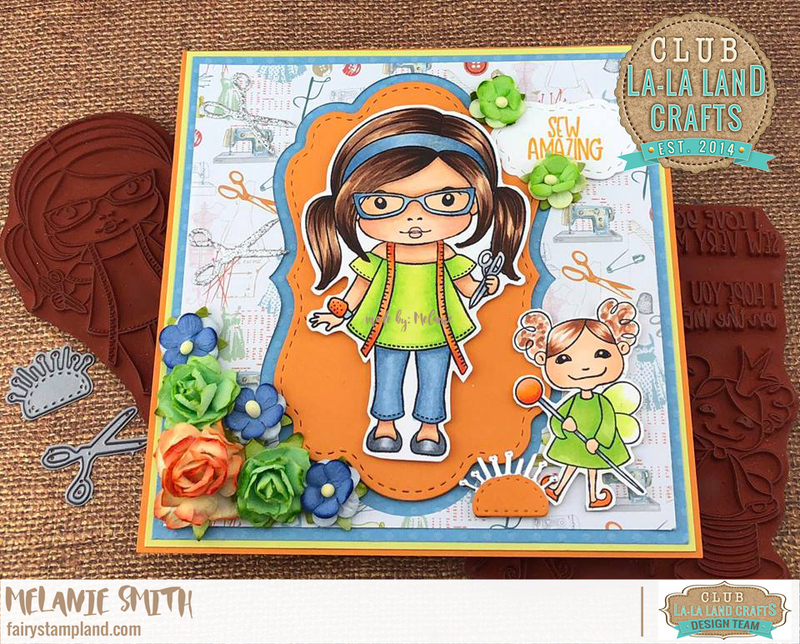 LDRS Creative has just released our fun summer release. This fun set named "Shore Lucky" includes 25 photo polymer "clear" stamps which make creating a fun summer scene super easy! Step 1: I started with a A2 size card base ( 8.5 x 5.5" folded in half) and using the newly released Hybrid Inks in "Swimming Hole, Bali Blue, and Iced Tea" I swiped (ink pad directly onto paper) the white card with the ink pads in a wavy pattern to create the sky, sea, and sand. Step 2: I used some of the stamps from the "Shore Lucky" stamp set to create the clouds, waves, and sand, also using our Hybrid ink. Step 3: I stamped the palm trees, dolphin, surf board, and the two little crabs onto white card stock. For the palm trees I inked the stamps with both "Four Leaf and Coffee Bean" Hybrid Inks. Using my alcohol markers I colored in the dolphin, surf board and crabs in and then attached all of the pieces to the card front. Step 4: I stamped the "Shore lucky to have you" sentiment from the "Shore Lucky" stamp set with our "Raven Hybrid Ink"
Step 5. I wanted to add a frame to give the card a photo feel so I cut 1/4" strips of blue card stock which matches the A2 card base that I attached the scene onto. I layered them around the edge of the card popping it up with foam tape. DT Product Review: This was my very first time using the new Hybrid Inks by LDRS Creative and I am excited to let you all know what a wonderful product they are. I had no issues using them with the clear stamps. Each stamped image came out crisp and clear on the first try. For the dolphin I actually stamped him in "Dark Washed Jeans" and since it is a Hybrid ink I was able to color it in with my alcohol markers without any smears or smudging. Club La-La Land Crafts ~ Sew Amazing!!! 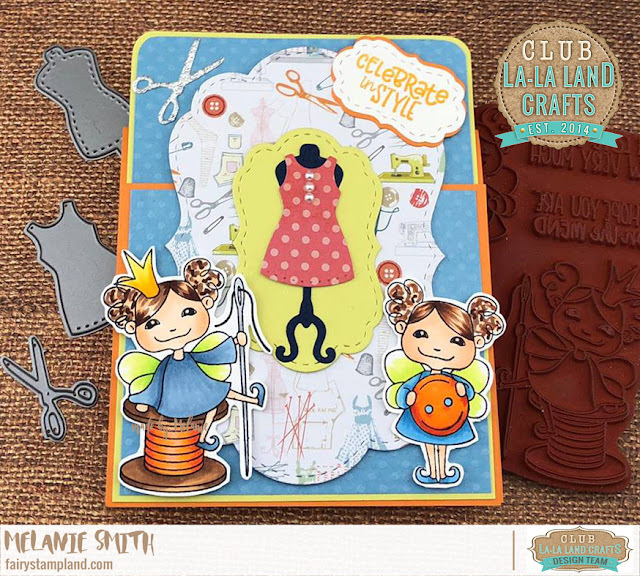 I am coming to you today with 2 new cards featuring June's La-La Land Crafts Club Kit. If you are already a member I bet you are already loving the "Sewing" theme of this set. If you are not yet a member I would love for you to JOIN US. You will be blown away month after month when your surprise shows up in your mail box. It is the only "Club" I have been involved with that has never disappointed me. 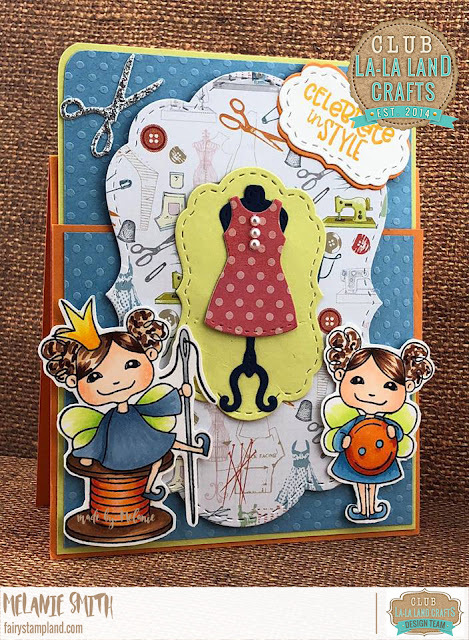 With this card I have used both of the La-La Land Crafts Nested Frame Die Sets. With the Largest die from the Nested Frame Large Die Set I cut both the patterned paper as well as the blue polka dot paper. The from this same set I used the smallest die for the sentiment. For the orange layer I used the largest die from the Nested Frame Small die set. These sets work so well together. For "In Style Marci" I popped her up using foam tape. All of these layers really give depth to the project. Her little fairy friend is also popped up and is ready to help Marci with her project. From the Monthly Club Kit I used both the "In Style Marci" stamp along with one of the fairies from the "Sew Amazing stamp set. The dies with this set are adorable as well. I have used both the scissors and the pin cushion on this project. The dress form, dress die and the adorable fairies are all from the June Club Kit. 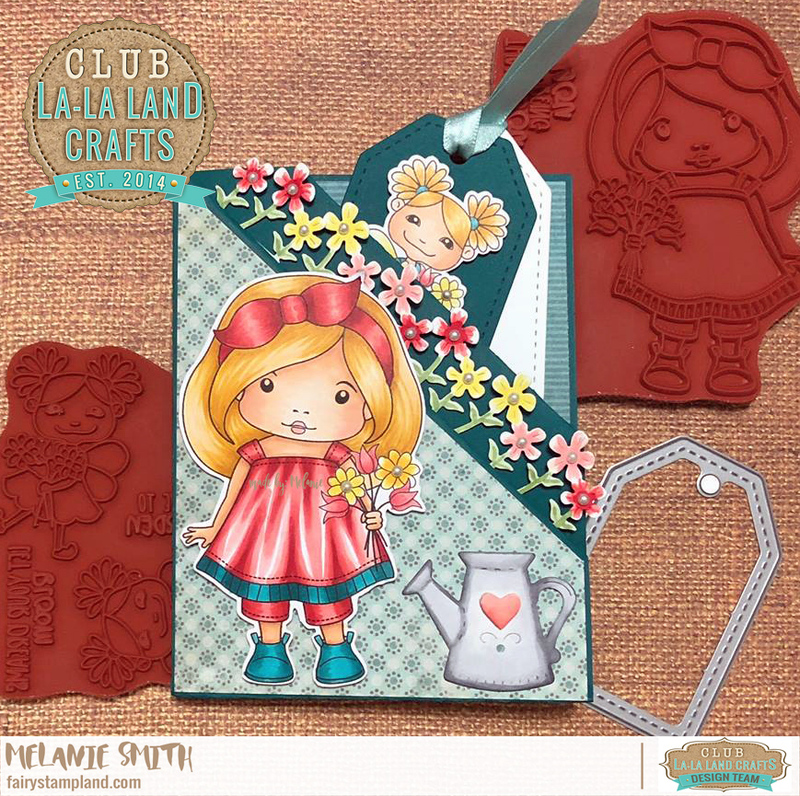 La-La Land Crafts Club kits include exclusive stamps and dies each and every month. They have a value of approximately $70.00 all for $39.99! If you would rather get dies only or stamps only we have those options as well. Our exclusive Club products will not be released to the general public for a minimum of 6-12 months. So if you love them as much as I do you will want to save lots of money and sign up for the CLUB! Thanks again for following my work. I hope I have inspired you to get creative today!